Is it an art fair? Is it an exhibition? No, it’s Supergraph! The inaugural Supergraph describes itself as a “fiesta”. It exists somewhere between an art fair, a design exhibition and a party. There is more things to do than at an art fair or exhibition. There is a large area just for drawing if you feel motivated and inspired. There is space to relax, the exhibition equivalent of white space on a page, and there is always music in the air. 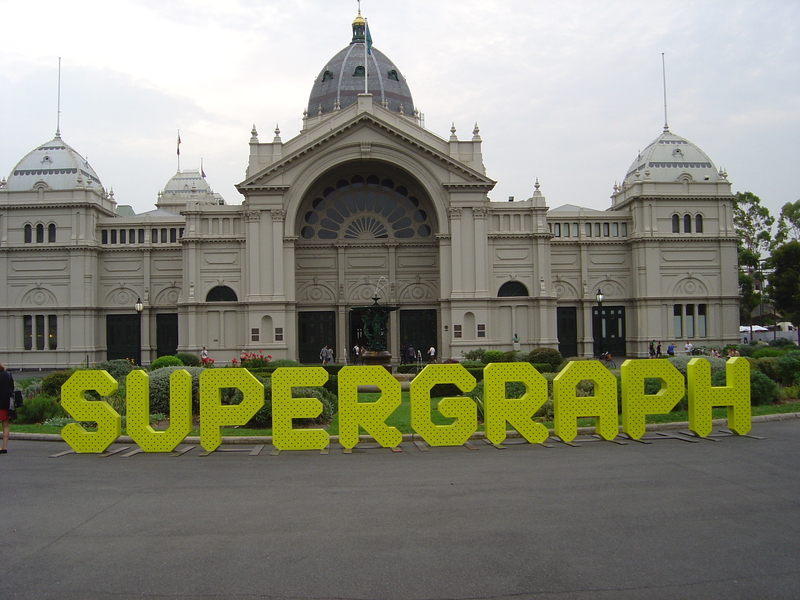 The location of Supergraph at the Royal Exhibition Building makes clear the relationship between it and the art fair as the Royal Exhibition Building is the location of the biannual Melbourne Art Fair After working at art fairs Supergraph’s Director, Meika Tai wanted to make it accessible for both the exhibitors and the visitors. Dressing in the colour of the exhibition is the fashion. For the opening Meika was wearing a beautiful laser cutwork white silk suit with fluorescent yellow bra underneath. There is a lot of yellow in Supergraph: yellow is the colour of Melbourne, the colour of Melbourne Now, the colour of Ron Robertson-Swann’s Vault. Megan Hales, Prototype, center piece at Supergraph, bi0-fi degradable cornstarch packing material and synthetic polymer paint. Supergraph has been well designed. There is the great cardboard furniture and temporary fences by All Of This. Curating the 36 stalls to have a range of materials and techniques from screen printing, letter press printing, t-shirts, graphic novels, posters, ceramics, piñatas to finger nails. The stalls are meant to be pop-up studios with activities rather than just selling. Most of the exhibitors are local, there are some familiar exhibitors: Lamington Drive, Positive Posters and Signed and Numbered. There is an Etsy stall. But Supergraph is not just stalls there are very large salon exhibitions with some international exhibitors from the UK, Thailand, Iran and Japan. On the other hand Supergraph is the Ikea equivalent of an art fair. It is all well-designed, affordable and internationally tasteful and like Ikea there are pencils and note paper hanging with the exhibition so you can take note of the number of the work that you want to buy. Ikea really does have a stall at Supergraph so that you can buy a frame for your new print. However, it is not as horrible, commercial, pointless and tasteless as the Affordable Art Fair. Supergraph is the logical next step in Melbourne’s current love of graphic arts and illustration. 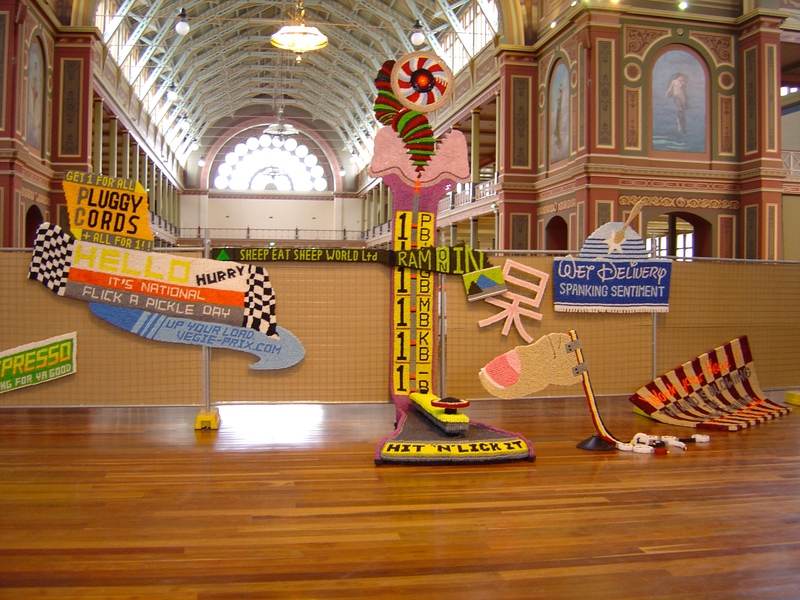 This entry was posted on Saturday, February 15th, 2014 at 10:52 AM	and tagged with graphics, Lamington Drive, Melbourne, Royal Exhibition Building, Supergraph, t-shirt and posted in Art Galleries & Exhibitions. You can follow any responses to this entry through the RSS 2.0 feed.